In 1947, when India won independence from Britain, East Bengal became part of Pakistan. The large majority of the country is Muslim. The sizeable minority of Hindus considerably diminished after 1947, especially during the civil war (1971-1972), when many fled to West Bengal in India. 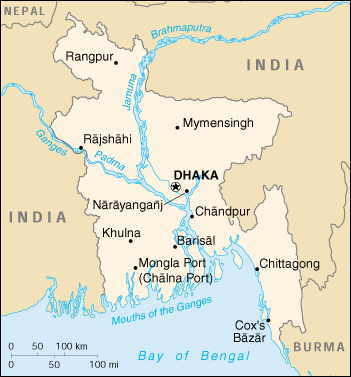 In 1971 Bangladesh was proclaimed an independent secular state with a socialist orientation. Through a military coup it was turned into an Islamic state.